Music is such a wonderful pursuit for mind and body because it is not just an art form, but combines a myriad of other disciplines, including mathematics, biology, and physics. This series, Math and Science in Music will explore the many ways in which music incorporates a variety of these disciplines. Our bodies are amazing at doing so many things. The physiological makeup of our bodies allows us to make music by playing instruments, or by using our voices. 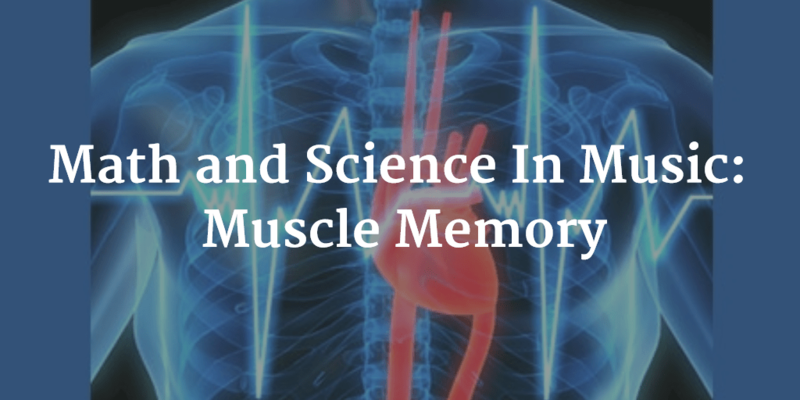 One of the most amazing aspects of these bodies is what is commonly referred to as ‘muscle memory’. This term can be a misnomer, because it does not actually mean that memories reside in your muscles. Instead, our brain has the ability to develop what are known as ‘procedural memories’, an ability which is developed through repetition. By practicing something over and over again, our brain develops synaptic pathways that allow our bodies to perform these tasks without conscious thought. For musicians, muscle memory can be a tremendous boon. Instrumentalists develop the ability to play scales and other technical aspects of music without conscious thought. Making the technical aspects of musicianship a ‘procedural memory’, allows musicians to focus on the artistic expression of their music. It is also what allows them to learn and remember massive amounts of musical data; so much so that a professional musician can sit down at a piano years later and still play a piece they haven’t performed for many years. One caveat about muscle memory is that the synaptic pathways do not distinguish between good playing, and poor playing. If you repeatedly practice a scale or a piece incorrectly your brain with put those errors into your procedural memory, and it can be very difficult to ‘un-learn’ those mistakes. What other effect does physiology have on music? Tell us in the comments below!